After 17 days and 2,500km, a Massey Ferguson 5610 tractor reached the South Pole with the help of the Antarctica2 expedition team. The Antarctica2 team with their Massey Ferguson at the South Pole. The 2014 Antarctica2 mission aims to drive a Massey Ferguson MF 5610 agricultural tractor on a 5,000km round trip from the coast of Antarctica to the South Pole. The quest echoes the achievement of explorer Sir Edmund Hillary who led the first mechanised expedition to the South Pole in 1958 using Ferguson TE20 tractors. Lead driver, Manon Ossevoort said she has fulfilled a lifelong dream to drive a tractor to the "end of the world". Ossevoort has already driven a tractor 38,000km from her home in the Netherlands across Europe and Africa. 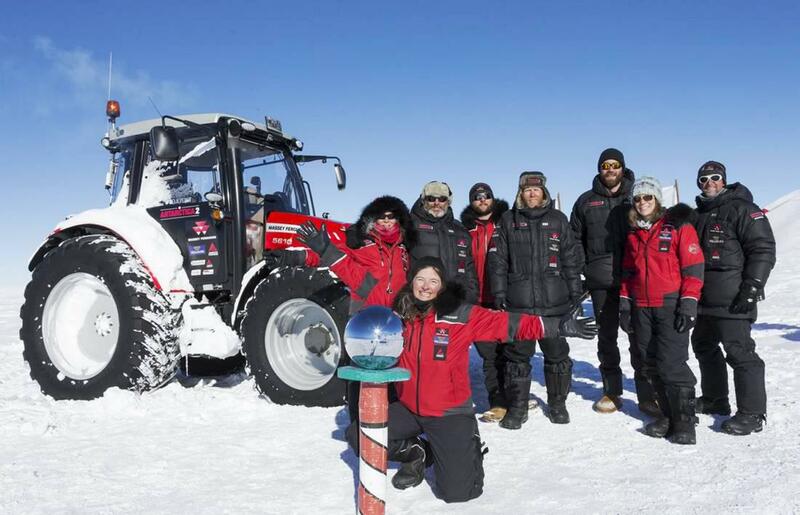 The South Pole journey was sponsored by Massey Ferguson, together with the support of other farm equipment industry partners and the expertise of her polar crew. The challenging trip took 17 days of tough driving across ice. With the Antarctic’s constant daylight at this time of year, the team created their own 30-hour days, driving the MF 5610 hard for 23 hours or more at a stretch, pausing only for routine maintenance and driver changeover before pushing on. The tractor engine has been running almost non-stop since the expedition departed on 22 November. Along the way, the polar crew tackled treacherous crevasse fields, steep climbs and deep, soft snow. At times temperatures plummeted to minus 56 degrees. After a day’s rest at the South Pole, the Antarctica2 team will pack up, turn round and embark on the same route back to the Antarctic coast. The team hope to be back in time for Christmas.